Basketball player Tristan Thompson – the father of Kardashian’s daughter True – is alleged to have been unfaithful with Kardashian’s half-sister Kylie Jenner’s best friend Jordyn Woods at the weekend, according to reports in the US. 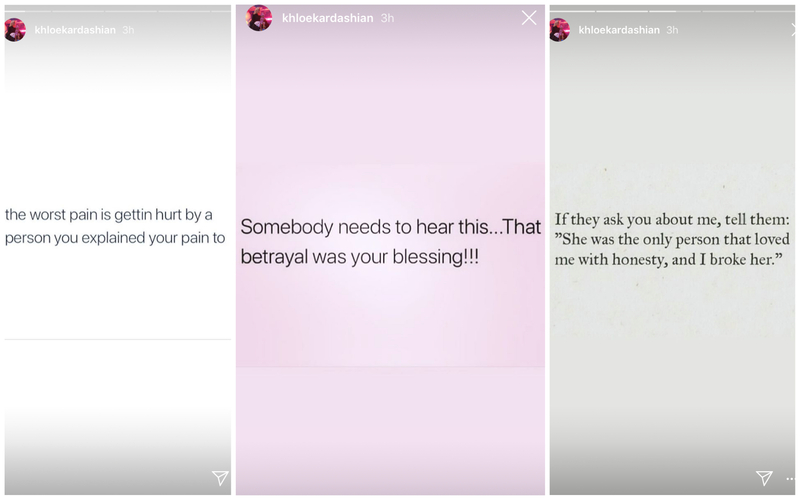 Kardashian, 34, has now broken her social media silence for the first time since the reports emerged. “If they ask you about me, tell them: ‘She was the only person that loved me with honesty, and I broke her’,” the third said. The Keeping Up With The Kardashians star also posted a cartoon drawing of a woman crying and she is believed to have deleted all pictures of Cleveland Cavaliers player Thompson, 27, from her Instagram account. The couple welcomed their daughter in April last year. They were first claimed to have split earlier this week by US gossip site TMZ, who reported that Thompson and Woods, 21, became intimate at a house party on Sunday. Woods was Jenner’s long-time best friend who lived with her and who worked alongside the beauty mogul to launch a make-up line called Kylie X Jordyn. Woods also previously modelled for Kardashian’s Good American jeans brand. Neither Woods nor Thompson have addressed the allegations.